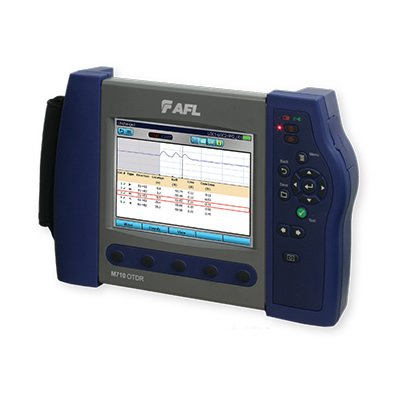 The WDM900 Lightwave Test Set is a rugged, portable and easy-to-use measurement tool that simplifies in-service testing of CWDM and DWDM-based networks. Within seconds of connecting to the network, WDM900 users know which channels need attention and exactly what action is required. The WDM900 acquires the network signal, measures the characteristics of each CWDM and DWDM channel present from a single port connection, and determines which signals satisfy user-defined acceptance thresholds. All channels are tested for channel power. DWDM channels also report wavelength deviation, optical signal-to-noise ratio and other indications of network and signal integrity. The revolutionary AFL Health Meter (US Patent Number 9,515,726) graphically summarizes network performance via an easy to interpret, color-coded indicator for each channel. Simply touching a non-conforming channel launches the AFL Channel Detail display which shows graphically and numerically how the measured attributes compare to the acceptance criteria. 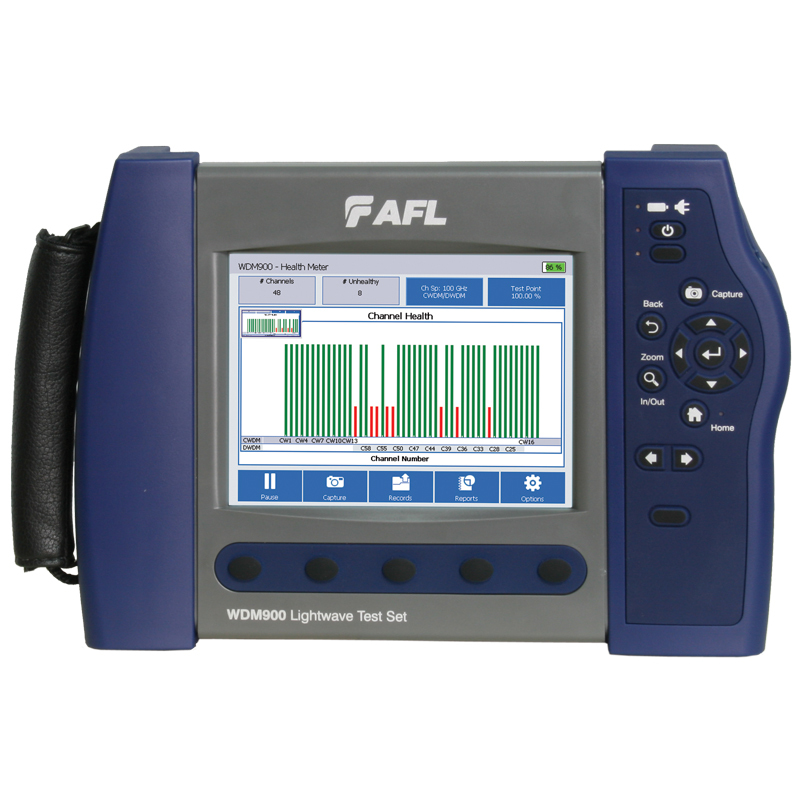 Users will also appreciate the many WDM900 features designed to make them more efficient. For example, conventional test equipment requires users to manually scale measurements to compensate for monitor port attenuation. The WDM900 eliminates this task with automatic monitor port compensation. The WDM900 displays warning messages when channel input power or total input power exceed the allowable dynamic range and reminds user to employ the input attenuator accessories included with each instrument. A comprehensive reporting application provides one-touch capture and reporting capabilities. Reports are easily managed using time stamps, report titles, keywords and tagging, and are easily exported in .pdf and .csv formats via a USB memory stick. The WDM900 is engineered to perform under the harsh conditions found in central offices, head ends, network nodes and outside plant. Its highly integrated solid state design features no moving parts for reduced service and repair costs. The internal wavelength reference and temperature-stabilized circuitry eliminate long warm up periods and accuracy drift induced by sudden temperature and humidity changes. The optical path of the WDM900 is hermetically-sealed to resist the dust, dirt and contamination typically found in the field. The WDM900 is packaged in a proven rugged housing that withstands rigorous military-grade drop testing. Internal optical components are Telcordia GR-1221 rated. The WDM900 features a high-contrast 6.5 in color display. It weighs just 5.2 lb and its shock absorbing case occupies only 7.5 in x 10.5 in x 2.75 in. A Li-ion battery will power it for over 8 hours on a single charge.